Juventus had to settle for a narrow first-leg lead after missing several good chances against Borussia Dortmund in their Champions League last-16 tie. Marco Reus exploited Giorgio Chiellini's slip to scamper in and shoot home just three minutes later. 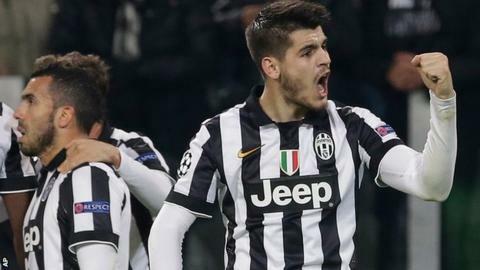 Alvaro Morata's careful finish put Juve back in front and the hosts could have stretched away in the second half. But the Italians ultimately failed to exploit Dortmund's fragility and will take only a one-goal advantage to Germany. The win took the Serie A champions' unbeaten home run to 47 games and they made the fast start that a simmering atmosphere at the Juventus Stadium demanded. But the Spaniard's well-hit shot and Dortmund goalkeeper Weidenfeller's fumble presented Tevez with a simple finish five yards out. Juventus manager Massimiliano Allegri: "In the domestic championship, we are used to having the ball for 70 percent of the game. "We're not used to not having the ball and defending, but in the second half we did both. This match was a step forward for a team that wants to do well in Europe." Borussia Dortmund manager Jurgen Klopp: "I think the result was fair. We had a good game in the first half, but we gave them two goalscoring opportunities. Juventus had two great chances and didn't miss. Juve is a great team." Match ends, Juventus 2, Borussia Dortmund 1. Second Half ends, Juventus 2, Borussia Dortmund 1. Foul by Jakub Blaszczykowski (Borussia Dortmund). Offside, Borussia Dortmund. Matthias Ginter tries a through ball, but Pierre-Emerick Aubameyang is caught offside. Substitution, Juventus. Kingsley Coman replaces Carlos Tévez. Substitution, Juventus. Simone Padoin replaces Arturo Vidal. Attempt missed. Roberto Pereyra (Juventus) right footed shot from the left side of the box is close, but misses to the right. Assisted by Álvaro Morata. Stephan Lichtsteiner (Juventus) wins a free kick in the defensive half. Attempt missed. Marcel Schmelzer (Borussia Dortmund) left footed shot from outside the box is too high. Assisted by Nuri Sahin. Delay in match Leonardo Bonucci (Juventus) because of an injury. Attempt missed. Mats Hummels (Borussia Dortmund) header from the centre of the box misses to the right. Assisted by Jakub Blaszczykowski with a cross. Roberto Pereyra (Juventus) is shown the yellow card for a bad foul. Attempt missed. Giorgio Chiellini (Juventus) header from the centre of the box is just a bit too high. Assisted by Claudio Marchisio with a cross following a corner. Corner, Juventus. Conceded by Roman Weidenfeller. Attempt saved. Carlos Tévez (Juventus) right footed shot from outside the box is saved in the top centre of the goal. Assisted by Arturo Vidal. Attempt missed. Henrikh Mkhitaryan (Borussia Dortmund) right footed shot from outside the box is close, but misses to the left. Assisted by Jakub Blaszczykowski with a headed pass. Substitution, Borussia Dortmund. Jakub Blaszczykowski replaces Ciro Immobile. Offside, Juventus. Stephan Lichtsteiner tries a through ball, but Arturo Vidal is caught offside. Attempt missed. Ciro Immobile (Borussia Dortmund) right footed shot from outside the box is too high. Assisted by Nuri Sahin with a headed pass. Attempt missed. Giorgio Chiellini (Juventus) header from the centre of the box is high and wide to the left. Assisted by Claudio Marchisio with a cross following a corner. Corner, Juventus. Conceded by Oliver Kirch. Corner, Juventus. Conceded by Mats Hummels. Attempt blocked. Carlos Tévez (Juventus) right footed shot from the centre of the box is blocked. Foul by Ciro Immobile (Borussia Dortmund). Foul by Stephan Lichtsteiner (Juventus). Corner, Borussia Dortmund. Conceded by Giorgio Chiellini. Corner, Borussia Dortmund. Conceded by Stephan Lichtsteiner. Attempt missed. Carlos Tévez (Juventus) left footed shot from the left side of the box is high and wide to the left. Offside, Juventus. Claudio Marchisio tries a through ball, but Álvaro Morata is caught offside. Attempt blocked. Marco Reus (Borussia Dortmund) right footed shot from outside the box is blocked. Assisted by Marcel Schmelzer. Attempt saved. Ciro Immobile (Borussia Dortmund) right footed shot from the right side of the box is saved in the centre of the goal. Assisted by Pierre-Emerick Aubameyang.